"SurveyMethods: Create accurate surveys easily"
This tool serves to create surveys easily, free and fast. The best thing is that you have many options to prepare a complete and accurate survey. You can create surveys from scratch or from a variety of prototypes already created. With this software you can obtain data that will help you to know the opinion of your potential customers about your brand. You need to create an account to be able to carry out your surveys. In addition, the free version may be limited in terms of allowed questions (20 questions per survey) so, if you need something more complex, you will have to buy the premium version. 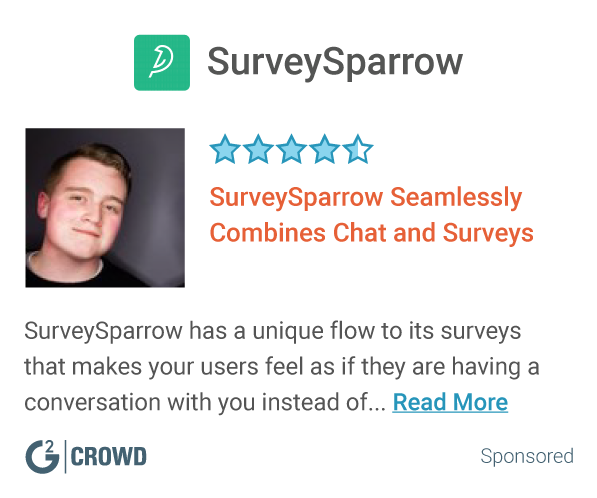 I recommend trying SurveyMethods if you have a small business and you want to do surveys to your customers or suppliers to get their opinions about your brand. If the free version is useful but you need more complex surveys, you can get the paid version. SurveyMethods has helped me to offer surveys to my target audience to know their opinion and be able to improve the direction of the company in a free and easy way. "Great Way To Send Out Surveys! Love Their Graphics!" Great look on their site. Their tools are easy to use. They offer pre-made surveys and the capability for you to create your own from scratch while adding a great creative look with their templates! Nothing, I think that their site is easy to use, their support system is great, and their look for the surveys is very professional. I really like their format for creating and sending surveys! Survey Methods has everything you need to personalize a survey and make sure that you get the feedback you need while maintaining a professional aesthetic. As a small business, it is vital that we get donor feedback as well as client feedback. This software allows us to do that while making a very professional inmpression. "Simple, intuitive and useful tool"
Es una aplicación muy fácil y útil para realizar encuestas. Lo mejor es que, además de ser muy intuitiva, ofrece muchas posibilidades, incluso siendo una versión gratuita. En la mayoría de las ocasiones es necesario actualizar para exportar respuestas. If you want a tool to get surveys quickly and easily, it is a very useful application, especially for marketing. Gracias a esta herramienta he podido realizar encuestas de manera rápida y sencilla a muchos de mis consumidores. "SurveyMethods is a professional tool"
It is a professional and easy-to-use tool. It provides functionality to create surveys, analyze data and export reports in PDF. It provides templates that are versatile and customizable, allowing us to quickly do surveys and distribute it across multiple channels. I would like it to modernize its interface because it looks a bit basic. It fits the needs of companies of all sizes. It is an affordable product that ensures high response rate. This tool collects and analyzes the data in detail and accurately. The reports we get through SurveyMethods provides us with information that is crucial to evaluate and improve our marketing strategies. It is suitable for creating online surveys. It's intuitive and functional, has several options for distributing the surveys either through email or social networks. It has survey templates that facilitate the elaboration of surveys and multiple customization options. Nothing. It is an application that is not complicated. It is a great option to conduct customer satisfaction surveys. Delivers tools to collect and analyze information efficiently and quickly. It meets the needs of our organization. Very versatile software. Allows my group to analyze and get a consensus for our different focus groups, simple and easy to use. Better than previous survey programs we have used. Allows us to customize and survey to our needs, no restrictions from tight templates. "Best way to quick collect data"
Use it. It offers great benefits for a mid size company. "Efficient for an affordable price." The mode in which the website arranges transactions is very easily understood. It's quite affordable for such an efficient method. I love using it for surveys. A few kinks in administration but overall not too bad. "Survey review is a pretty good software tool." What i like about survey tool is that it reminds me a lot about survey monkey. You get to make your designated questions and have people answer as best fit. What I dislike about survey methods is that there is not much freedom and autonomy as with other survey apps to pick and choose certain things. Some business benefits survey methods provided is troubleshooting, communication efforts, and screenshooting. Great for parents, teachers and staff. Works well with common programs like Microsoft office. Can be selective with the intended audience and organizes in easy to read charts. Nothing with the software itself just hard to get tech support in a timely fashion. * We monitor all SurveyMethods reviews to prevent fraudulent reviews and keep review quality high. We do not post reviews by company employees or direct competitors. Validated reviews require the user to submit a screenshot of the product containing their user ID, in order to verify a user is an actual user of the product. Hi there! Are you looking to implement a solution like SurveyMethods?